Home Costs > How Much Does a Chimney Crown Repair Cost? How Much Does a Chimney Crown Repair Cost? Most masonry-based chimneys are capped with a crown to prevent water from getting inside the bricks as these chimneys have to be open at the top in order to allow the smoke to be released, but they also need to be covered to ensure that the rain and snow cannot get in and cause damage. Over time, unfortunately, cracks can start to form, allowing water to seep behind the cracks. When more water gets in between the cracks, this is going to cause the chimney to widen. If the homeowner fails to fix the cracks early enough, the whole crown may have to be replaced, which is often the most expensive option. How much does it cost to replace or repair a chimney crown? The cost to repair a chimney crown will depend on the size of the chimney, how easy it is to access the chimney, where you live and who you hire. Depending on these factors, the average cost of a chimney crown repair can range anywhere from $400 to as much as $2,200, but for basic repairs, not requiring a rebuild, the costs can be in the $200 to $450 range for a simple sealing. Since there are different types of crown repairs, the costs are going to vary widely. Because of this, we highly recommend using HomeAdvisor.com to receive multiple quotes from local contractors for free. For example, SchenectadyChimneySweep.org charges $500 to $2,000 based on the size of the chimney and how easy the chimney can be accessed. On this forum thread on BogleHeads.org, one member claimed he ended up paying $1,000 to replace a crown on his two-story house, including the damper and cleaning. To fix a chimney crown, a special sealer will be applied to the crown to prevent new cracks from forming and prevent existing cracks from spreading. Before applying this sealer, however, the contractor will have to wait for a sunny day with no rain in the forecast. The first step is by prepping the crown by cleaning it with a nylon brush. Once it is clean, any larger cracks will be filled with a silicone-based caulk. After the cracks are caulked, the surrounding chimney area will be taped off and a sealer will be applied. If the chimney has to be replaced, the old crown will be chipped away and a new one will be installed; however, before a new one is installed, new concrete may have to be poured. If this is the case, the process can take up to a week because of the drying period. If the chimney crown is extensively damaged, it will often have to be rebuilt. If this is the case, you will be looking at a price closer to that $2,000 range. However, if the chimney only has smaller hairline cracks, then the repair could be as little as $400. If your roof is complex and the chimney is hard to access, the cost will be more. If you need a rush job, you will probably have to pay extra to cut in front of other customers who are waiting. 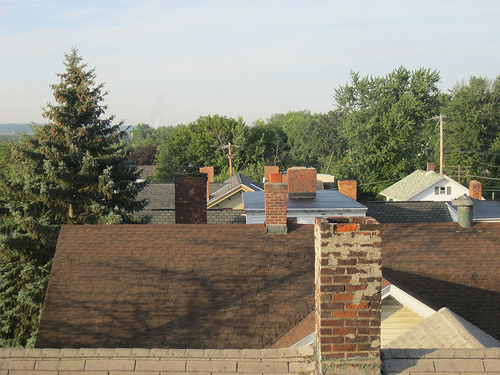 Bad chimney crowns are one of the main reasons chimneys deteriorate. It does not hurt to have a chimney inspected every year or so to make sure your chimney is in good working order. Make sure that you clean the area thoroughly before starting to seal it. Otherwise, the seal will not stick like it is supposed to and cracks will reappear quickly. If performing the job on your own, use gloves and use your hands to get the sealer inside the cracks. You will be able to accomplish this better by hand than by using a tool. Once the sealer has been pushed into all of the existing cracks, use a layer of duct tape around the base of the crown to provide extra protection. Repairing the chimney crown is already saving you money from even more expensive repairs to the chimney itself in the future. Maintenance is always the best way to save money. Consider doing this job on your own instead of hiring a professional contractor if you don’t mind tackling the job. FamilyHandyman.com has a how-to guide showing you exactly what you need to do to fix a crown problem. This should only be done if you are making minor repairs. If you are going to hire a professional contractor, try your best to get as many quotes as possible. Get an inspection annually. By catching this problem early, you can potentially save thousands. Even if you do not want to pay for one, get on the roof at least once a year and look for any visible cracks. If you notice any cracks, it is best to fix the problem right away.